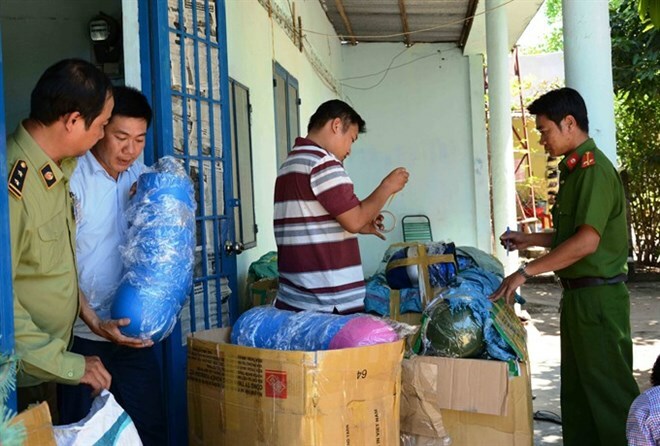 Hanoi, March 19 (VNA) - The police, army and customs are acting together against smuggling and counterfeiting, but the results fall short of expectations because the crimes are getting more sophisticated, officials said. Authorities discovered 27,327 cases of smuggling, trade fraud and counterfeiting in the first two months of this year, the National Steering Committee for the Prevention and Control of Smuggling, Trade Fraud and Fake Commodities (also known as the 389 Committee) reported on March 17. It said 304 cases were taken to court. As many as 223,262 cases of violations were handled last year, up 8.23 percent year-on-year, the committee said. Administrative fines totaling over 21.5 trillion VND (940 million USD), up nearly 60 percent over 2015, were submitted to the State Budget. Relevant authorities prosecuted 1,560 cases and 1,863 people involved. Dam Thanh The, Chief of Office of the 389 Committee, said the smuggling of fake goods was getting more complicated as smugglers were using sophisticated techniques. Despite several agencies co-operating with each other in cracking down on smuggling and other crimes, the results had not been as good as expected, he said. “Fake goods are still rampant (in the market) and criminals have become more and more artful,” The added. He said six separate agencies are responsible for preventing and fighting smuggling and trade fraud: customs, border police, police, tax authorities, maritime police and market management forces. However, fake goods continued to flood the market because of ineffective co-ordination among several agencies and law enforcement. In 2017, the 398 Committee will intensify its focus on clarifying responsibilities of heads of ministries, agencies and localities for letting smuggling, trade fraud and counterfeit products happen in areas under their jurisdiction. Those found not fulfilling their tasks or caught covering up illegal activities would be strictly punished, The said. Any official caught facilitating serious and prolonged smuggling and other forms of crime, arousing public indignation, would be severely penalised, and even be charged with criminal liability. In cases where there is insufficient direct evidence, but sufficient circumstantial evidence of collusion with criminals, all concerned officials would be transferred to other jobs, he added. He said the 389 Steering Committee had directed its standing office to be available 24 hours on two hotlines 0981.389.389 and 0961.389.389 to receive any information and ideas as well as public petitions against smuggling activities. Since the establishment of the hotline, the 389 Committee has received hundreds of reports of violations, of which 114 with adequate proof were transferred to competent authorities for further investigation.